Okay since I have officially purchased two of these sets at Toys R Us today. Therefore I believe we can now talk about them. I bought 7306 Golden Staff Guardians. 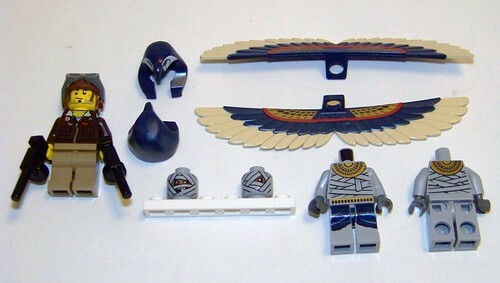 Its a 70 piece set with two mummies, an adventurer..AND a new scarab shield (be still my heart!). It was $9.99. I also bought 7326 Rise of the Sphinx. This set...the sphinx totally is a creature who has legs that can be moved. Totally amazing. This one cost $49.99. I shall be building these today. Here are pictures of the boxes. As I have stated on my Flickr, please do not steal my pictures and post them all over your Flickr and Brickshelf. Have some honor. Pretty fun. I like the figs and weapons. Now that both have been built, I can honestly say my favorite of the two is the smaller set. It has the scorpion shields. The sphinx set is okay. I won't purchase it again. It makes me wonder if maybe these sets will be a cross over type line that has both traditional building and a "creature" build a lot like the Vikings like. I haven't seen any other sets but these two. The queen of tan is pleased, for I really do enjoy ancient Egypt. I love the tan pieces, the dark tan that complements, and the dark red vehicle elements. I love the mummies. They remind me of the mummies in the Mummy 1 and 2 movies with Brenden Fraser. The scarab shields are my favorite new element. I like the staff from the collectible figs better than the staff in these sets..so far. Once I have a gem in place, I might prefer these. The new "hero" has a nice little red boo-boo on his face showing that you have a true hero who does get hurt as he battles. I may or may not take pictures of the actual sets. I haven't decided. I would definate buy for pieces. If I could, I would get multiples of Pyramid of the Pharaoh. Is the sword wielded by the mummies a new item? I was a bit bummed when I learned that kingdoms did indeed not have a new great sword. The kopesh looks pretty fantastic. These sets are really going to steal from my kingdoms budget. Here's hoping kingdoms looks as good as it did in it's first year. Wait? No? Could it really be? Black 75 degree double convex slopes on the ears of the sphinx?? Everything tiled? Check. Vegetation on Steriods? Check. Excessive stone work and Rocks? Check. Ugghh. I'm so jealous. First two guys get 11 cases of series 3, and now this. Hahahaha, just kidding. Congrats! I'll have to keep my eyes out for the sets. They look awesome. I'm going to buy multiple copies of 7306 Golden Staff Guardians and the small $7 looking set. I think that the dark red vehicles are a bit odd, but the motorcyle is just so cool. I'm so excited, but at this rate, we're going to start seeing 2012 sets on shelves during the summer 2011. Wow. Looks like I'll be adding a mummy legion to my undead army. OK, the flying mummies don't look nearly as dumb as I'd first thought. Actually they look quite cool. I bought five of the sets last night at the local Lego store. They did not have the Sphinx set. I built the three smallest and was quite pleased. The flying mummies are cool. The golden staff does have a hole at the top where a jewel can be inserted. I was curious about that but couldn't find any photographs to confirm my suspicion.